Beyond olive groves and vineyards, tall pines stretch graciously across the plains. Swallows swirl over red-tiled rooftops, church towers vie with cypresses as focal points, and broad fields merge into a misty blue horizon of hills. 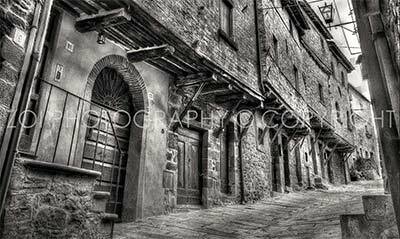 A Grand Tourist would have been enchanted by the sweeping panoramas on offer from almost every corner of Cortona. They might have come here as a relaxing break from the cosmopolitan culture of Florence, if they’d done their homework – in 1502, Leonardo da Vinci sketched this little Tuscan town as a sepia cluster of hilltop houses, combining urban and rural charm in a way that survives to this day. 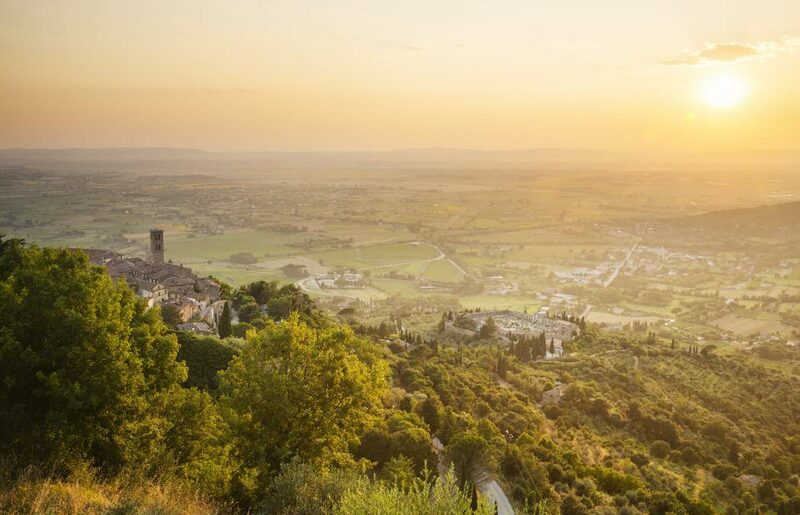 “The town has such dignity in its architecture that it makes you want to stand up straight when you walk through it,” says Frances Mayes, the American author who helped put Cortona on the map with her best-selling memoir Under the Tuscan Sun. The book – translated into 46 languages and made into a major film in 2003 – describes the restoration of her pink-and-apricot 18th-century villa, called Bramasole (“Yearning for the sun”). She discovered the house more than 20 years ago, “abandoned since World War II, full of spiders and old newspapers”. And she set out to rescue it. “This house is only a baby in Italian terms – only 270 years old,” she says. Back in the town’s central piazza, the cafe tables and chairs that spill on to the sun-warmed flagstones are filling. A latecomer opens the door of the town’s cathedral and music floods into the square. Inside, flanked by confession boxes, an organist is thundering out the overture to Mozart’s Don Giovanni: a libertine with more to confess than most. Later, a busking jazz band will strike up and push on towards midnight. No one seems overly worried about rushing home.